There is something about blue that gives it a universal appeal. Perhaps it’s due to its vast spectrum of shades, each with a distinct quality that evokes an equally distinct response. For some, blue can mean coolness, serenity, calm; or intensity, mystery, magic. For others, it can bring to mind a tranquil sea, the midnight sky, a delicate blue flower, the intense cobalt blue of Mediterranean interiors, or a chirping bluebird. This marked popularity of blue makes it an appealing choice for a wedding event color palette, while its range of shades is an event stylist’s dream. Decor elements may be items that are naturally blue—such as hydrangeas, forget-me-nots, hyacinths, or delphiniums—or that come in the desired shade, whether candles, tableware, or favor containers. When applied tastefully and stylishly, decorating a wedding event with such a likable color as blue is simply irresistible. 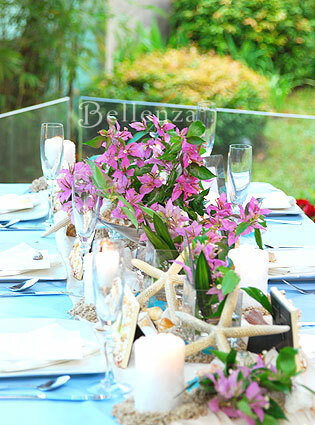 An elegant seaside engagement party is the perfect opportunity to emulate the look of the sea and sky in the table setting. A light blue tablecloth sets the stage for this display with touches of a complimentary warm color, orange, on the shell accents. 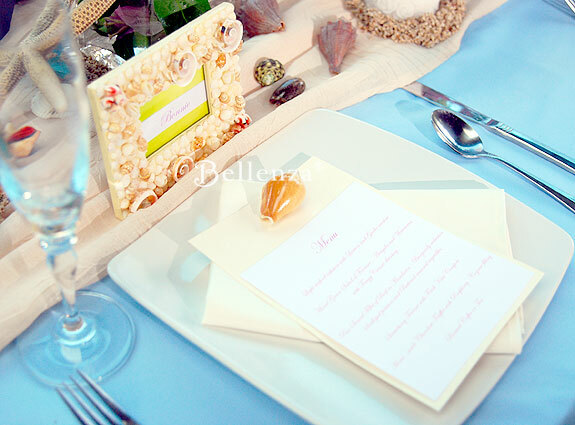 The ivory of the plate, napkin, and menu card stands out strikingly, creating a clean, crisp look in keeping with the seaside venue (see above). Blue has been such a favored color for porcelain ware that the term “blue and white” is the familiar name for a type of Chinese ceramics and “Delft blue” refers to the fine porcelain pieces crafted in the Dutch town by that name. For a party with a Russian ball or winter theme, Fabergé-inspired porcelain eggs in footed egg cups take center stage on an opulent favor table. The blue floral designs and gleaming gold trim on these containers convey an Old World charm perfectly in keeping with the theme and the richness of the setting. 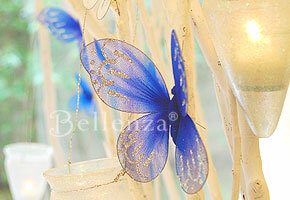 Blue need not always be the dominant hue at a wedding event to make its presence felt. It may be used to interplay with other colors, such as in this combination of navy blue, royal blue, and lilac used for a fairytale-inspired “Dream Come True” theme. 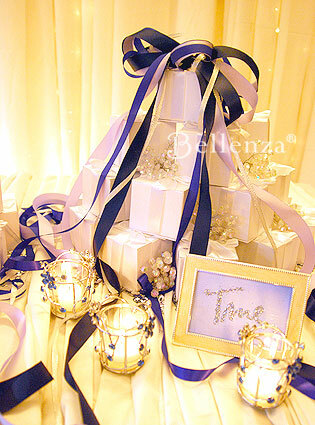 Presented in ribbons draped gracefully over a towering centerpiece of white favor boxes and extending amidst the glittering, candlelit table display, the navy and royal blue serve to add a touch of drama to a primarily soft and sweet setting. Unique shades of blue can make a decorative statement. 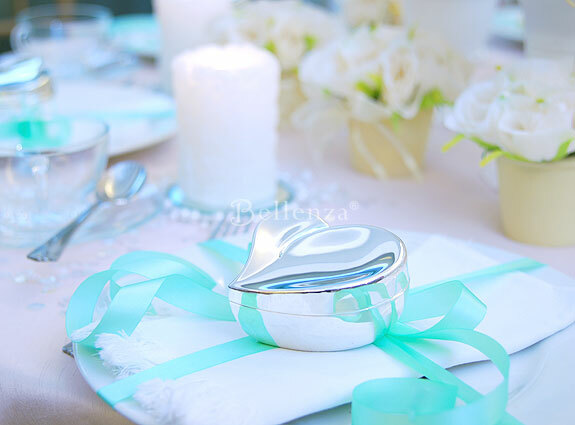 Satin ribbons in Tiffany blue, for instance, immediately enliven an otherwise pale or neutral table setting while maintaining a cool, classy look. Silvery keepsake boxes atop the ribbons remind one of elegant Tiffany pieces themselves. 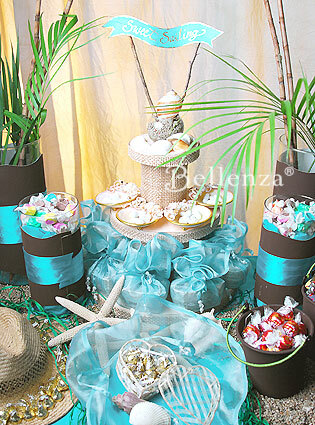 A stunning shade of aqua is paired with brown and sandy hues to capture a seaside look of a “Sweet Sailing” themed event. While blue dominates the display, it is softened and sweetened by the natural tones of seashell trays filled with white Jordan almonds arranged on a tiered centerpiece. 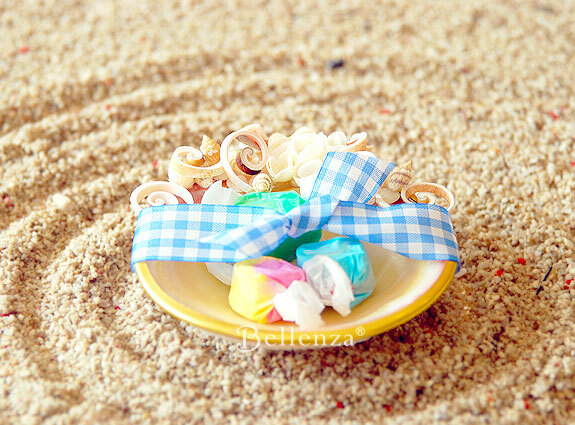 Colorful, pastel taffy candies teeming out of simple cylindrical glass vases are also decorated with aqua ribbons and brown paper bands. Individual seashells and a starfish echo the seaside theme, while providing final tempering touches to the all-blue display. In a table setting, colors play off of each other, bringing out their individual subtleties in the process. 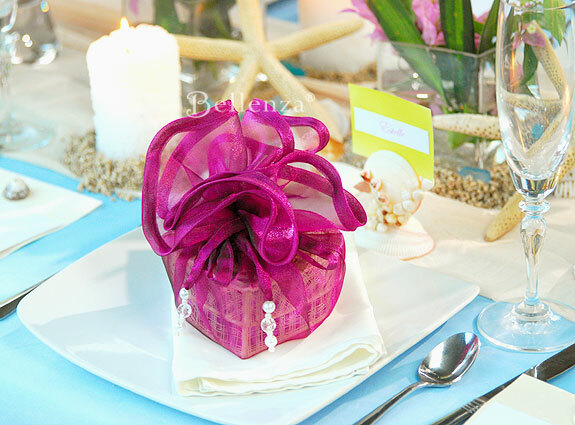 For instance, a predominantly sky blue display gets a lift with the infusion of elements in a rich magenta or deep fuchsia, such as this organza-wrapped favor box. 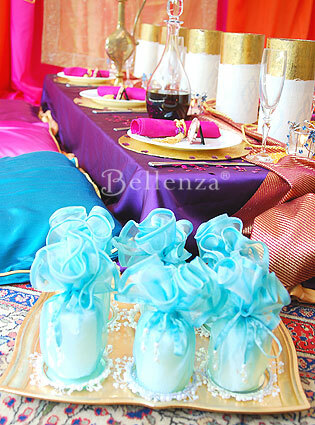 In turn, the blue background makes the organza’s color appear more vivid and vibrant against a backdrop of cool hues. This same contrast with fuchsia can be made with the use of flowers. An outdoor table setting owes its appeal to a lush centerpiece of fresh orchids in this vibrant shade set against a sky blue tablecloth. Once again, the use of blue as an accent rather than as the dominant color at an event makes it more dramatic. 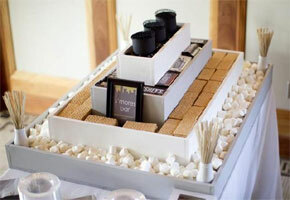 White candles, for example, can be presented as spa party favors in aqua organza wraps. 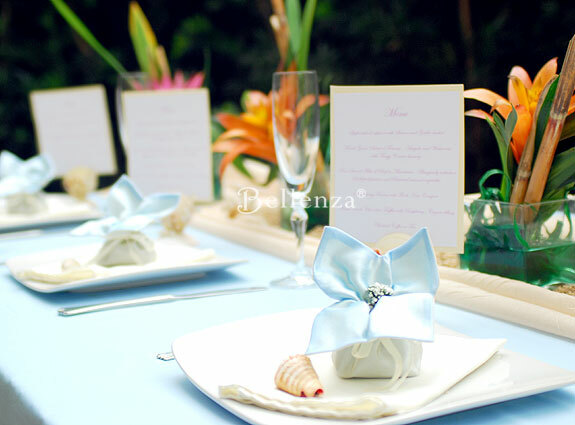 The color lends feminine chic to the favors themselves, while making a striking addition to the occasion’s decor. True to its adaptable quality, blue can take on a variety of appearances when used in different patterns. A blue and white gingham ribbon adds homey charm to a beach-inspired favor dish. Blue stripes can play up a nautical or preppy scene; while blue polka dots, florals, and paisley patterns can create a whimsical ambiance at a bridal shower or tea party. Items in a striking shade of blue readily catch one’s eye, even tucked away amidst other decor elements. 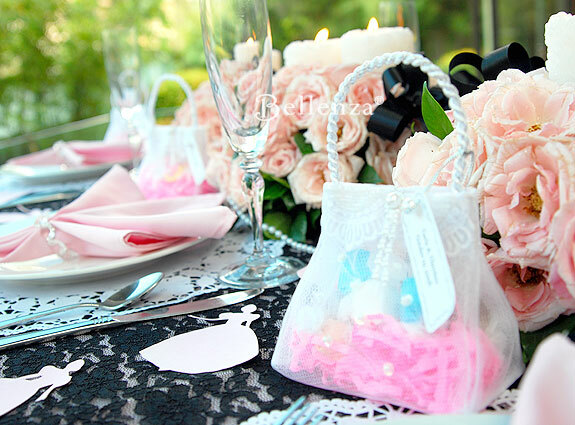 Intentionally “out of place” in this muted Victorian-inspired setting, edible treats in aqua-colored wrappers, for example, are invitingly visible through the mesh of a dainty favor bag. In a table display already alive with strong colors, blue serves as a perfect complement. 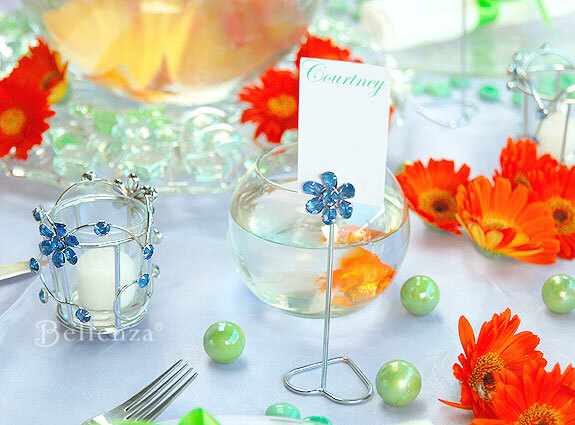 When used in subtle decor accents, such as place card holders and votive candle holders dotted with blue rhinestones, it in fact serves to bring out the other colors more prominently. 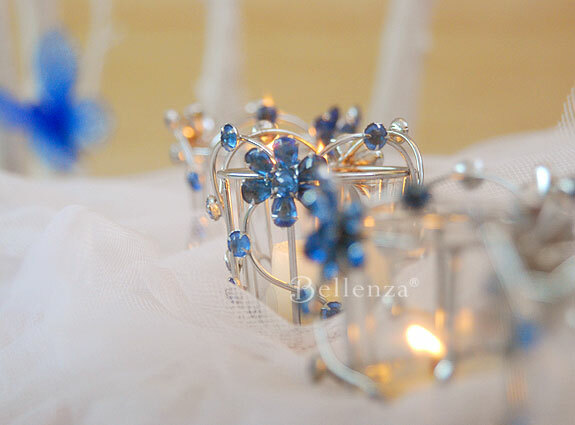 Glittering blue rhinestones are a lovely touch on votive candle holders in gleaming silver. Resting upon a delicate tulle table covering and with tiny tea lights reflecting off the blue stones, these votives create a fittingly ethereal look for a butterfly themed wedding reception—featuring decorative accents all in shades of blue. What beachside wedding party would be complete without decorative elements making reference to the ocean and its many variants of blue? 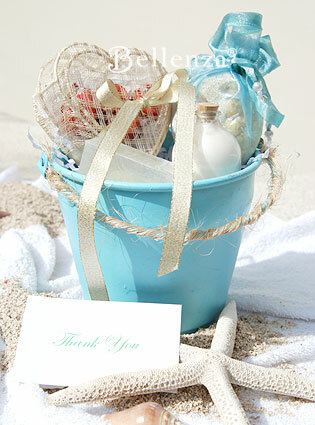 A pale blue bucket filled with favors, treats, and tropical aqua -wrapped spa essentials sends guests off in style—its ivory-colored contents perfectly echoing the surrounding sand and seashells. What a lovely beach wedding guest gift! The key is to first decide on the desired look for the occasion and then to select the particular shade or shades of blue that will create it. For instance, a monochromatic palette using shades ranging from sky blue to royal blue to Wedgwood blue to navy blue may result in a clean, crisp appearance, an intense, exciting ambiance, or a calm, cool atmosphere. 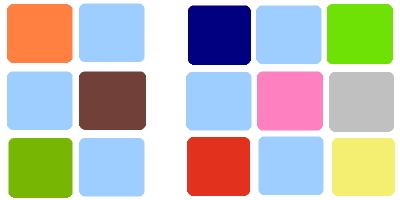 It all depends on which shade is chosen as the dominant one. Alternatively, blue used with different colors also results in distinct looks. Blue combined with violet accents, for example, says “cool,” while blue combined with accents in warm colors like red, orange, pink, or yellow sets a bright and cheery mood. I was wondering what shade of blue do you recommend for a wedding during the winter. I see a lot of people using pale or pastel blue, but wanted to know what other blues are nice. Plus, I want to have it match with silver. Any ideas? Blue for winter could not be better! If you want to match blue with silver, then you can try a metallic or jeweled hue of blue. This is extremely fitting for a winter wedding especially if you also plan to use a lot white accents to mimic the beauty of the season. Silver can also be matched with a fuchsia and works with silver as well. Moreover, if you want to have a muted color palette, you can go with Tiffany blue, red, and an accent of silver and white. What about a pallette for Cobalt blue. The wedding is in March 2010 in New Orleans at night. We want it to have a spring feel since we are in the south and spring will be arriving soon. Also thinking of using pale pink and chartreuse. What do you think? Our wedding will be taking place in mid August. My husbands favorite color is a midnight blue and mine is a very dark green, almost black looking in the right light. I am wondering if these are two colors you could use together in a wedding without it looking to dark and gloomy? Hello Rebecca. You may want to consider an accent color to add contrast because these two colors will most likely look too dark in the photos. For example, adding gold will work nicely with dark green. But I’m not too keen on having a color combination entirely based on midnight blue and dark green. A dark green and gold palette would actually like quite elegant. Also imagine jewels tones of dark green like emerald! You can then incorporate a color such as ivory which matches nicely, as well! You may want to check out our own design using a dark green, gold, and burgundy color combo: A Wedding Party with a Romantic Tuscan Ambiance. I am trying to come up with ideas for my 10th anniversary celebration. The colors for 10th anniversary are blue and silver, and the gemstone is diamond. I am thinking of using diamonds as the theme and different shades of blue and silver. Can you show me different shades of blue along with silver so I can see how they go together. Thanks alot. Oh yeah, my anniversary is in October. Hi! Our church wedding will be end of August 2010 at 3:00 P.M. and planning to have a garden reception afterwards (around 5:00 P.M.). My fiance and I like blue but we don’t know what shade of blue should we consider. We want to have something to accent the blue..maybe gold or silver? Can you tell me what’s the best color combination? Thank you! I love aqua, but don’t know how to match these colors. Help! Thank you. Match aqua with any of these colors: brown, silver, lime green, chartreuse, or even a bold hue like fuchsia! Another option is to have a monochromatic palette in all blues! Do you think aqua and sea green would look good together? Definitely. They are an elegant pair of colors. You can imagine a beautiful scene filled with ivory blooms such as magnolias that make aqua and sea green come out even more. I would also incorporate some chic silvery accents just to glam up the look! To match cobalt blue, you can a pastel shade of lime green, orange, or yellow! Im thinking of using cobalt blue for the tabel linens and then some shade of a lighter blue maybe aqua and a splash of fuschia for maybe some of the flowers and center pieces.its a june beach wedding. what do you guys think? I’m having a fall wedding (outdoor ceremony, indoor reception) and using blue, silver and white/ivory. I’m having trouble finding the right shade of blue. Any ideas? We’re having a June wedding and it will be an indoor formal reception. I’m using white linens & napkins, silver chargers and white china. I’d like to use blue hydrangeas and green orchids in my arrangements, but I’m having trouble deciding on a dark accent color, Any ideas? Good question! You may want to try an accent of chocolate brown or perhaps plum. Just be sure that it’s not too dark so it won’t look black in your photos. Hi!! My brother plans to get marry this December. According to his bride to be, she wants blue,magenta and pink for their motiff. Will it be a good combination then? ?Thanks in advance..
My question is me and my husband are re-newing our vows in july of 2011. I was thinking about blue and orange or purple and emerald…Any ideas. can you please help me? i want a sunset to night wedding, it’s an outdoor wedding. the venue is located at the top of the mountain, it’s overlooking actually…. i want to have it unique… a different wedding… what i have in my mind now are white big pillars, lights.. i want to add on drapes but i’m afraid of strong winds…. i don’t want to use flowers… except the bouquets.. , i want crystals, lights, lights, candles, lights….. and i’m a little bit confused with the color….. i want silver,gold,blue and green…. i’m not sure if this would look nice…. i want it elegant, romantic and classy.. can you please help me? Baby blue is a wonderful color that I don’t see very often in weddings, but when paired with the right set of hues, this understated color can truly come alive. Match it up in a 2-3 color scheme with hues such as orange, jungle green, or even red! I have a disaster! March 2010 beach wedding and I wanted dark blue iris, yellow rose and calla lilies for my bouquet. I had a sash made however, and it is quite beautiful but it is chartruese blue! It’s a very bright, vibrant color blue. Unless you can help me with a color palete I’m considering ditching the flowers altogether… All white flowers are SO drab!!!! What a dilemma! It doesn’t seems to appear that white would make it drabby anyways. Im getting married in may, my fiance likes dark blue and wants that in somewhere..im also thinking of doing black, what other colors work with those? Im not a fan of orange or yellows..please help!! For a dark blue color palette, consider matching it with silver with a touch of chartreuse. You may also match dark blue with stunning fuchsia. The color palette would look fantastic against a scene of lovely pink blooms! hi liz, melanie and team! im getting married on december and my reception venue is an indoor glass garden. 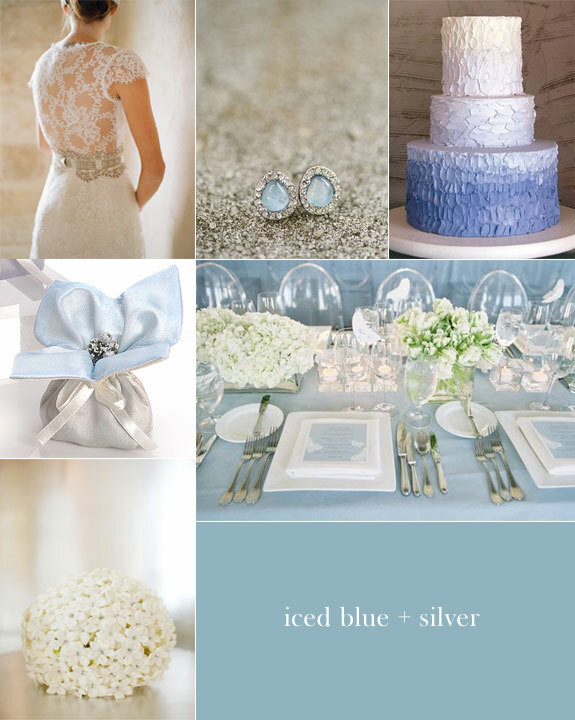 my groom’s fave color is blue so i thought of using midnight blue, white and silver as our color palette. do you think this combo is OK? to make use of the venue, id like to have a floral inspired wedding though there arent too many blue flowers in our country and we dont have winter season for a winter theme.. but i believe this palette looks classy and elegant. what do you think? do you have suggestions for a better blue palette or theme? Your color scheme is quite elegant! As for flowers, you may want to try blue hydrangeas, iris, and the like. They are quite common in most countries! Consider adding ivory flowers as well such as stephanotis, which would balance nicely with silver! Hi there! I am getting married on 11/11/11 on the beach in the Bahamas…. and I am having trouble choosing the colors. The only request my fiance has had is for blue… between a royal and cobalt blue. I am having trouble figuring out the other colors. White sure… but my dress is off white! I would like to bring in an island feel as well, while not losing sight that its November! He does not like green…. With that being said any advice you could give on the best way for the groom to dress. Should he go with a blue shirt and linen suit? Black or off white??? Hello! We are getting married in June 2012 and having an outdoor ceremony and an indoor reception. I am going to be using colbalt blue and tiffany blue as our colors but I am not sure what to use as an accent color. Thinking of silver, or white, but want to make it look fun and summer looking. Any suggestions? Hi Stephanie. Bahamas! Wow. Since he doesn’t like green, you may want to use fuchsia or yellow to match with cobalt blue. Lovely colors that will bring out a Caribbean feel. Stick with white for his attire such as a crisp linen suit! The backdrop will be your decor as well. So, go easy on the colors here! Hi Kelly. Consider adding silver to your color palette. You may want to infuse some greens such as chartreuse that has a yellowy hue, wihch is ideal for a summer wedding. Accents like gold would be lovely too. Think of it as a way to add glamour to your decor! 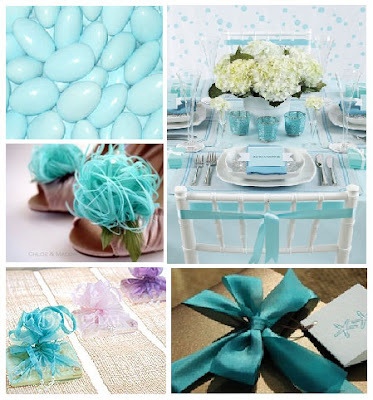 I am getting married next year August- i am considering tiffany blue for my colour scheme; i would like for my bridesmaids to wear the tiffany blue dresses with white. im concerned about what colour to wear in regards to my dress- i really like ivory but not sure if it will go with the colour scheme which is tiffany blue and white. Hi, we’re getting married in november and my colours are red and silver highlights. my fiancee wants skyblue in the colour scheme. How do we put that together. Also can a skyblue shirt go with a red tie? Me and my sister n law are both getting remarried to our husbands in a double wedding. Do the pasttels colors blue and green go good together? any good ideas? 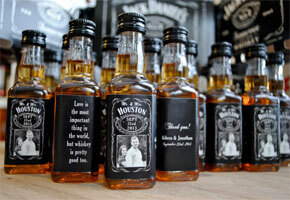 My fiance and I are planning for a 2013 Summer Wedding. We are looking into having sky blue, lavender, and silver or ivory as our color scheme. Please share your thoughts with us regarding our colors choice. Thanks! Have a great day! I am planning a wedding with the color pallette of dark marine blue and light pink accents. We like the idea of using wine bottles in some way as table centerpieces. Do you think the cobalt blue wine bottles can be used in such a way to accent with this color scheme or do you think a clear wine bottle would be best? Hi, Mel (getting married in August next year) — Definitely you can wear an ivory bridal dress, with the tiffany blue and white color scheme! See the pics shared by Dahlia above. Hi, Jessica (getting married in November) — You can apply the sky blue to the bridesmaids’ dresses, then have the red in the bouquets. Yes, a deep red tie and very pale sky blue shirt can go together. Hi, Shiela — Yes, any pastel colors look very well together, including the pastel blue and green you’re considering. In fact, it will give a very clean, fresh look to the whole wedding set against neutrals like ivory florals. Hi, Tammie — Sky blue, lavender, and ivory would look really pretty–with silver highlights here and there. You could have the bridesmaids wear sky blue dresses and carry lavender bouquets, while your own bouquet could be a lovely combination of both. Hi, Dahlia — Thanks for sharing your post! I’m sure our readers looking for “blue” ideas will find this helpful. Hi, Meme — Your planned color scheme sounds really elegant! If you can find bottles in a deep cobalt blue that would be great…but if difficult, you could wrap the bottles in dark marine blue fabric and have them hold light pink carnations, dahlias, or peonies. I am having a destination wedding in Costa Rica. The wedding ceremony will be on grass with the sea right next to us. I really dont know what colors should I use for the decoration (for the ceremony or party). 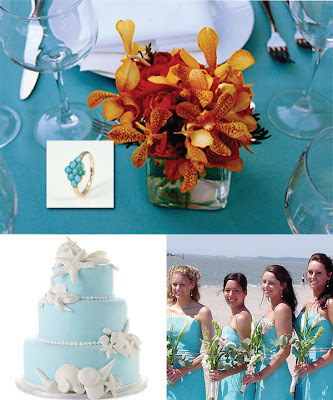 My fiance’s favorite color is blue *not baby blue, and while the wedding is on the beach we still want it to be elegant. I am color alphabet, so if you have a lovely pallete to post for me that would be so great. Hi, Wemi — The burgundy-colored floor may not be too much of a problem once the venue is filled with guest seating, the buffet tables, etc. So the colors you’ve chosen (dark royal blue, yellow, and orange) should still work out just fine for your country western theme. If there’s an area of floor, though, that might still be visible (for example, the open space for dancing), you could request the venue for a wooden dance floor overlay for that spot — hopefully in a more neutral color than burgundy! Hi, Fay — If the colors you mentioned will be for the wedding ceremony, they would be fine (maybe royal blue for the bridemaids’ dresses with sunny yellow bouquets, gray suits for the groom and groomsmen with yellow boutonnieres). But for the reception decor, maybe you could replace the gray with a softer neutral like ivory, then combine that with the royal blue and yellow for the table decorations. Hi I’m getting married march 2013 & I don’t know what colors to use? I love the orange. But if I pair it up with green & yellow it will look to summer help! And purple is off limits, my other half hates it. Please help! Hope these color options help! Hi, I am getting married in October and I wanted to use a marine blue as my main color but I am having trouble finding colors to coordinate with marine blue. Also, is marine blue okay for a fall wedding? and what colors could I use to bring out this color? I would like a classic look and I really love brown but feel that these two colors together make the theme really dark.. I don’t know what to do I am lost!! Hi, Edwinna — The nice thing about weddings today is there is no one “right” color palette for a specific season! So the trick is to be able to use your choice of marine blue, and pair it with a nice color for fall. As you said, brown may be too sombre. So we’d suggest trying a softer shade like a latté, then add matte gold highlights for a bit of glam. You could also go with an all-blue palette (from marine to pale blue), as shown here: http://www.theperfectpalette.com/2011/04/something-blue-palette-of-shades-of.html. Hello Angie — I’ve tried to find photos showing dark green with cream plus gold accents. I hope these will help! Help! Need some aqua and white ideas! I’m needing your advice please. We are getting married 5-11-13 and we’re going with a cobalt blue. Is that color ok for that time of year and what is best to pair it with? We originally had white, but I want a little contrast of color. Then we had a light lime green. Please Help!! Thanks. Hi Rochelle — Cobalt blue is a strong, bold color on its own. So pairing it with white would be too stark — unless, of course, you’re going for a crisp nautical look (which can be very striking, too). It all depends on the overall look or impact you hope to create at your wedding. If it’s classic you want, you could pair cobalt blue with bouquets in soft ivory, pale peach, and muted green. But if you want a bright, perky look, you could pair it with one of these: fuchsia, apple green, or even orange! Striking color choice! For your groom and groomsmen, we’d suggest bringing in the royal blue in their ties — paired with either charcoal or light grey suits. Then, the gold could be added in the form of metallic boutonierres, tie clips and cuff links. My sister will have her wedding soon and they are considering blue as their wedding motif but no idea what shade of blue will be suitable during summer and what color combination to use.we will appreciate any advice that you may care to give….Help us pls. Hi Nancy! For the choice of what kind of blue for your sister’s wedding, so much depends on the look she’s aiming for. If she’s going nautical or is having a seaside ceremony/reception, navy blue would be nice and snappy! But if her intention is to have a refreshing atmosphere to beat the summer heat, we’d suggest very soft, pale blues. A third option would be bright aqua or turquoise, if she’d like a modern, trendy look. Hope these ideas will help! Hi! we’re planning for a garden wedding and i want it to look classic and elegant.. are the colors royal blue, gray and pink okay? i want royal blue to be the main color. do you have any other suggestions? thanks. I’m thinking of combining royal blue with a shade of yellow or gold and i am wondering how that works. Hi Rachel — Royal blue would make a striking main color for your wedding. I’m presuming, then, this would be the color of the bridesmaids’ dresses with pink bouquets; then the groom and groomsmen in gray suits with pink boutonnieres. Depending on the season of your wedding (for example, summer), you could also substitute a buttery yellow in place of the pink bouquets and boutonnieres. This would still work beautifully with the royal blue and gray! Hi Ernie — I noticed that you also posted a similar question on our other color article. Thanks for stopping by both! Definitely, royal blue with yellow (your choice of bright yellow or buttery yellow) and then gold accents would make a striking wedding palette! 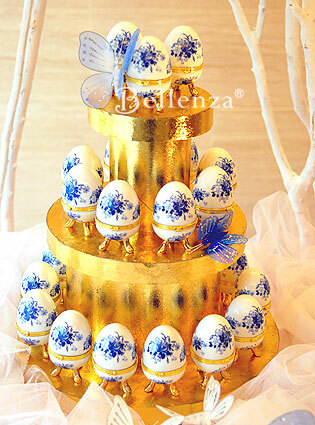 Since this is for a birthday, we would suggest that the choice of blue be based on the personality of the celebrant. Would the person like vibrant cobalt blue or a soft powder blue? Both of these shades go well with gold, but only in accent touches. Hope this helps! Your choice of blue, silver, and white is lovely. The usual way to apply these would be to have the bride in white, the bridesmaids in light blue, and the bouquets and accessories with accents of silver. But you may also try something a bit different. You could have your bouquet in shades of blue with a silver handle wrap, then your bridesmaids in short silver dresses with white bouquets with touches of blue and silver. What do you think? Me and my groom are trying to find color combinations for sky blue in December wedding and we would be glad to ask you all for wedding color combinations, but we are on tight budget. Hello Victoria — Sky blue is a lovely color (I personally think it’s not used often enough at weddings)! To keep things simple and cost-friendly, though, why not just use white florals and silvery or crystal accents. This way, your bridal party could just use silver accessories (that they can wear even after the wedding) and the gentlemen could wear sky blue or silver ties. You could also use the cutlery, glasses, vases, etc. that will already be at the reception as part of the silver decor — without having to spend on items in a different color. This would also go well with the holiday spirit in December! Help! I’m going to a wedding on September 27 in California. I was wondering if a pastel blue dress would be appropriate since its almost fall. I don’t know what to do! hiiii ,,,i wanted that tifany blue colour for my wedding which was originally booked in summer,,,,unfortuantelyy,,,we had to postpone till october ..we will be having aan ocean front wedding…can i still use tiffany blue and white for a fall wedding ?? Me and my groom are trying to find colour combinations for lavender for October wedding. We would be glad to ask about decor, grooms and bridemaids colour combinations for their attire. Wishing you a lovely lavender wedding! Hi Ruby! You don’t mention what season or in what location your wedding will be. But in general, your choice of shades of blue and green could be: “bold and modern” (TEAL and CHARTREUSE); “cool and fresh” (AQUA and MINT); or “pastel pretty” (POWDER BLUE and PALE GREEN). 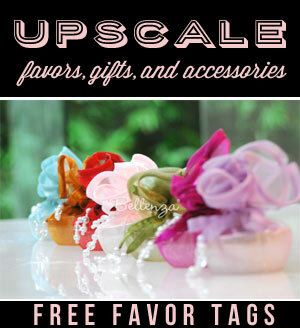 It really depends on your personal style, and what will suit the season and location. My colors are blue and gold for my wedding but I’m having trouble deciding on what shades of blue to use. I thought about turquoise or light blue because we like the lighter and brighter shades of blue compared to the darker blues like navy. Which shades of the lighter or brighter blues would be the best fit to go with gold. Hi Sara! Turquoise would definitely look “light and bright” combined with gold. You didn’t mention what season or location your wedding will be held in, but next to turquoise, you might also consider a soft, sort of dusty blue which would look very elegant with gold.